Tomorrow (Saturday) from 10:00 am through 1:00 pm, we are kicking off our signature drive and will be distributing petitions and collecting voter signatures for Redmond Initiative No. 1 (we’re meeting at 10:00 am at the Safeway at Bear Creek Village 17426 Redmond Way). At 1:00 pm, all of us are going to meet again in the Safeway parking lot and have a rally and hold a press conference where we’ll be able to show off our new signatures and answer questions. We are proud to join citizens in four other cities (Monroe, Bellingham, Longview and Wenatchee) who are also pushing initiatives seeking a public vote on automatic ticketing cameras in their communities. The 71% vote in Mukilteo last November was very inspiring and encouraging. 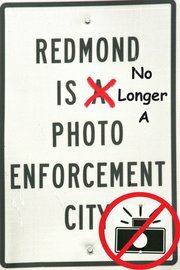 We are going to work really hard over the coming weeks and months to collect enough voter signatures to let the people of Redmond decide whether or not they want these obnoxious ticketing cameras in their communities. The attached letter to Redmond’s mayor and seven city council members and the attached petition for Redmond Initiative No. 1 explain the policies, logistics, and rationale for this effort.